The Century School of Gymnastics Ltd. purchased a Dodge 15 passenger van back in the early 1970’s to transport gymnasts to meets and to carry equipment to exhibitions around New York State. The roof rack was custom built by a metal shop in Suffern, New York. The fabulous paint job on both sides and the front of the Van was done by a motorcycle painting artist in Tempe, Arizona near Arizona State University where we were attending the National Gymnastic Clinic there during a Christmas Vacation. The whole custom paint job of a ghost tumbling cost only $300 at the time. 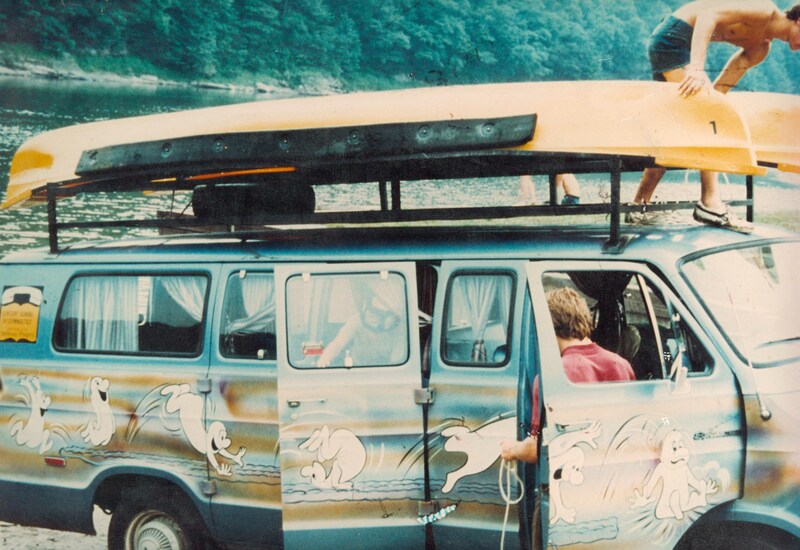 The Van lasted ten years and took us across America down to Florida twice and across to Arizona, Pa, Ct., Maryland and Virginia. In this picture we are unloading plastic canoes for a river ride down the Delaware river. Keith Anser is on top and I am behind the front door. My son Dean is coming out the second door. The canoes belonged to Camp Hill Day camp. Mel Cohen the camp director let us borrow canoes every summer to paddle down the Delaware river. In the later years of the van I took out the seats and converted the van to a Camper/sleeper with custom wheels and custom side exhaust pipes in chrome on the side of the van.